Today's defence-related news includes coverage of the Written Ministerial Statement which gives the Ministry of Defence the ability to call up reserve military personnel, as part of wider contingency planning, and reporting on the publication of annual figures on self-harm in the military. The Telegraph, The Times, The Daily Mail, The Sun, The Daily Mirror, and The Independent all report on a Written Ministerial Statement (WMS) laid before Parliament. The WMS gives the MOD the ability to call up reserve forces, if necessary. The MOD has not been asked to deploy forces in the event of a no-deal Brexit, and the department routinely undertakes contingency planning to ensure we are resourced for any scenario. Last year, the Defence Secretary Gavin Williamson confirmed that 3,500 service personnel would be held at high readiness, which would include both regular and reserves. The laying of this WMS is a routine part of this planning. The Times reports on annual figures published yesterday by the MOD, which show the rates of incidences of self-harm in the Armed Forces. While there has been an increase since 2011, the figures remain low, with 0.3% of personnel affected. The risk groups for self-harm in the UK Armed Forces are similar to the general population, where females and younger age groups were found to be at greatest risk of presentation at a hospital with a self-harm episode. “While rates of self-harm in the Armed Forces remain lower than the general population, at 0.3%, we are not complacent and encourage anyone struggling to come forward and access the care they deserve. 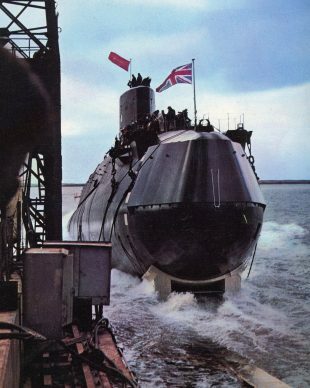 The launch of HMS Resolution. Events across the UK will celebrate the 50 years of dedication of submariners on the longest operation ever carried out by our armed forces, Operation Relentless.